Beer: Soak in 2 cups cool water and 1/4 cup white vinegar. Chocolate: Scrape off the excess with a plastic knife or spatula. Spray with a dish-soap solution (1 tablespoon clear soap to 10 ounces water), then dab with an enzyme detergent before washing (most everyday detergents have enzymes). Coffee: Stretch the fabric over a bowl and carefully pour boiling water through the stain from about a foot above. If the coffee had milk in it, follow with an oil solvent, like Carbona Stain Wizard Pre-Wash. If it contained sugar, follow a pretreatment product, like Shout Laundry Stain Remover, and let sit for 30 minutes before washing. Grass: Treat with Shout and let sit for 15 minutes. Use a clean toothbrush to rub in the solution. Ice Cream: Flush with cool water. Apply a prewash stain-removal product (like Shout), then soak in a sink filled with cool water and a few drops of detergent. Ink: To stop the stain from spreading, create a "dam" around it with petroleum jelly, then apply isopropyl alcohol with an eyedropper or a clean toothbrush. Dab with a cotton ball and mineral spirits to remove any residue (open a window for ventilation). Let dry and rinse with a dish-soap solution (see Chocolate). Ketchup: Apply Shout, then apply white vinegar with an eyedropper or a clean toothbrush to lighten the stain. Krazy Glue: WD-40 is normally lubricant used on creaky doors and rusty bike chains but it dissolves all adhesives. Place the shirt, stain-side down, on a stack of paper towels. pry with WD-40 and let sit for 5 minutes. Turn the shirt over, spray again, and remove the residue with a clean cloth. Rinse well. Mud: When the stain is dry, gently scrape off the excess with a plastic knife. Dab on a bit of water and some gentle detergent (like Woolite). Rub to form suds, then rinse. To lighten the remaining stain, apply a solution of 1 part water and 1 part white vinegar. Mustard: Saturate the stain with white vinegar, then apply a dish-soap solution (see above for formula). Permanent Marker: Apply Amodex Ink and Stain Remover to the area. Rub in with a clean, stiff-bristled toothbrush until the ink is almost gone. Red Wine: Sprinkle salt on the stain, then streth the fabric over a bowl and carefully pour boiling water onto the spot form about a foot above. White Wine: Run cold water over the stain, then spray with a dish-soap solution (see Chocolate) and pretreat by dabbing with detergent. - Most people have learned to sort by colors but sorting by fabrics is just as smart if you want your clothes to last. Hardy items like towels, denim, twill, and chinos should have their own cycle since they're made of tougher materials because when washed with finer cottons, they beat them up. Group T-shirts, nightgowns, and other delicates in a different load. - Chlorine Bleach: The benefits of using this is that it is the most powerful kind that not only whitens but disinfects and deodorizes. It can be used on every washable material except silk and wool. However, it can weaken fabrics because it's strong stuff so make sure to wear gloves when you're using it and to work in a well-ventilated area. If your washing machine doesn't have a bleach dispenser, wait for 5 minutes before adding it to the wash water. Pouring it in before then may destroy enzymes and whiteners in the detergent. - Oxygen Bleach: This kind of bleach is gentler and less toxic than chlorine bleach and can be used on all washable garments, though it's best for colors. Pour this into the water before adding the clothes (unlike a regular wash, when clothes go in first). Use warm or hot water; it's less effective when used with cold water. - Sweaters with bleach stains unfortunately cannot be saved and your only choice is to dye the whole thing its original shade. Or it the stain is tiny, try spot-dyeing it with an eyedropper. - You don't need bleach to get rid of protein stains like blood and sweat. For example, you can toss socks, tees, and undies into a big pot of water with a few lemon slices and bring to a boil for a few minutes. - Don't wash shirts all buttoned up because it can stress buttons and buttonholes and lead to premature poppage. Take the time to unbutton before tossing clothes in the washer or hamper. - Down and feather pillows can be washed but on delicate cycle. Make sure that they dry thoroughly in the dryer before using because moist feathers can breed mildew. After tumble-drying, place near an open window or radiator for a few hours before covering with pillowcases. - If a load is left sitting in the washer for 24 hours, rewash the load with cup of white vinegar and no detergent to kill the mildew odor. - If the labels on stuffed animals say "washable", place a few stuffed toys in a pillowcase secured with a twist tie, then wash in cool water and Woolite. Tumble-dry on cool. The same can be done with backpacks except air-dry it. - Leave the door/lid open between uses. Air-drying will curb mildew growth. - Loads of whites that turned pink can be fixed by soaking them in a sink filled with water and bleach (10 parts water to 1 part bleach) or OxiClean (read the label for amount). Check every 15 minutes or so and remove when white; 90 minutes should be more than enough and then machine wash. If it's still pink, try Rit Whitener and Brightener. - Make sure that your washer is level or vibrations can damage your floor and prematurely wear out key components, like the shock absorbers and tub bearings. Place a level on top of the machine and adjust the feet, which typically screw up and down. If that doesn't help, try placing a piece of plywood underneath the entire machine to help absorb vibrations. - Overloading the washer can create wrinkles and prevent your clothes from getting clean. On top of that, it can put pressure on the machine's bearings and shock absorbers, causing them to wear down prematurely. - Pop in a bleach-free washer cleaner (like Affresh) once a month to blast away odor-causing residue. Run the machine empty on a hot cycle. - Using top much detergent is bad because excess suds can hold the dirt pulled from clothes and get caught in area that won't always rinse clean, like under the collar, leading to bacteria buildup. To fix this, use only half the detergent you normally do, then gradually increase that amount if your clothes are not coming out as clean as you would like. But an exception is if you live in an area with hard water because then you may actually need more soap than you are using. Check the recommendation for hard water on your detergent bottle. - Washers typically come with black rubber hoses, which can blister and tear over time, causing a flood. Replace them with sturdier stainless-steel ones even if they look fine because they will live as long as the washing machines, while rubber hoses only last two to three years. 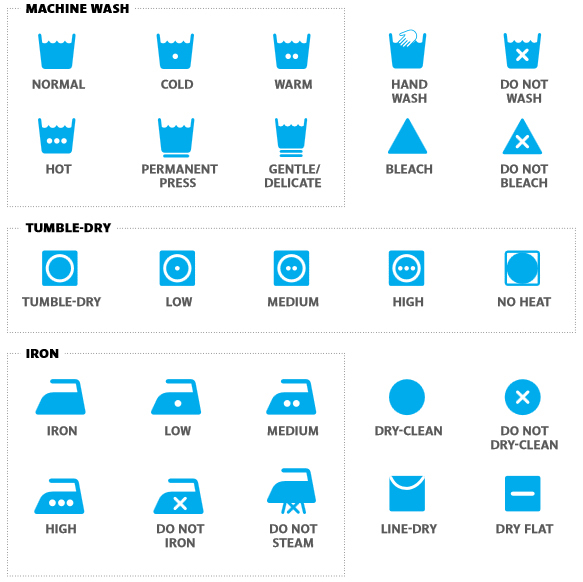 - Washing items that say "Dry Clean Only" label isn't always bad because most of these items can be hand washed and air-dried, and this includes natural fibers such as linen and silk. First, check for colorfastness by moistening a cotton swab with milk detergent and dabbing it on a hidden seam to see if any dye comes off. If not, go ahead and dunk the garment in soapy water just one or twice, then rinse and immediately roll it in a towel to extract moisture. However, you should stick with dry cleaning for certain categories like leather, suede, silk dupioni, anything with embellishments, and structured pieces like blazers. - When towels are no longer absorbent after washing, the most likely reason for this is because of fabric softener. It can coat terry cloth with a waxy, water-resistant film that ruins the purpose of towels. To dissolve buildup and restore the fluff, wash the towels the next few time with 1/4 cup white vinegar added to the rinse cycle, and skip the softener. - Even if you empty the lint filter after each use (like you're supposed to), lint buildup can clog the duct over time and become a fire hazard. If it takes more than an hour to dry a load, it's a sure sign that your duct is clogged. Once a year, detach the hose from the back of the dryer and snake a long brush through to push out the lint like this brush here. Also scrub the lint filter once a year with a small toothbrush and a bit of detergent. Rinse it, then air-dry completely. - Folding your clothes right out the dryer really does eliminate creases so if you're a procrastinator, at least give everything a quick shake and put them in loose piles so they can be quickly and neatly stacked afterwards. - If a load is left sitting in the dryer, toss in a damp, clean hand towel and run the dryer for a few minutes to relax the wrinkles with steam. - It's best to run back-to-back dryer loads because it takes advantage of retained heat from the previous cycle, cutting down on energy use. - I prefer line drying most of my tops because there is less wear and tear (lint is actually tiny particles of clothing). Other bonuses of doing so is energy reduction and the natural bleaching of the sun if you hang it out to dry (though you should turn clothes inside out and put them out of direct sunlight to minimize fading). Hanging items upside down also helps to reduce stretching in key spots like the shoulder. If you want to avoid that crinkly, stiff feeling, add 1/4 cup white vinegar to the wash cycle because the acidity eliminates soap residue. - Shrunken wool is impossible to save unless the wool has been treated (the garment label will indicate this). Otherwise, the fibers constrict in the water and there is no remedy. - To reduce lint, add 1/2 cup of white vinegar to the rinse cycle because the acidity of white vinegar prevents lint from sticking to fabric. - Try using liquid fabric softener if dryer sheets don't work. It adds a static-resistant chemical to fabric fibers, coating them completely, unlike dryer sheets. If your clothes are sticking to you while you're wearing them, just run the long side of a wire hanger between your clothing and your body and then over your clothes. - Turn dark jeans as well as shirts with transfer designs and clothes with embellishments, inside out to prevent fading and protect embellishments. - Using the "Permanent Press" option on your dryer, which is a medium-heat cycle with a cool-down period at the end is a proven crease curber but don't pack clothes in because they need to float freely or else they'll wrinkle. - You can skip ironing dress shirts, pants, and school uniforms by taking them out of the dryer 10 minutes before the cycle is done when they're still slightly damp. Give them a good shake and hang them up, pressing with your hands. And last but not least, here's a handy guide for laundry symbols, which I don't think I'll ever commit to memory..
LOFT + German Chocolate Cake!